More than 1,600 associations call Chicagoland home. Associations pump more than $10.3 billion directly into the local economy each year. Chicagoland membership associations have more than 27 million individual members and 250,000 corporate members who serve public, private, and charitable interests nationwide. More than 9 million donors support their important work. All of these people and activities mean thousands of jobs, millions in tax revenue, and an immeasurable positive impact on the advancement of industries, professionals, and communities served by associations. Of the total $10.3 billion in annual Chicagoland expenditures, approximately $947 million is spent annually on printing, information technology services, web design, accounting and legal fees. More than half of Chicagoland associations fully or partially outsource these vital services, creating a tremendous opportunity for firms offering them. Chicagoland associations report $2.6 billion in annual spending on conferences, conventions, and meetings — 34 percent of which stays in Chicagoland. Approximately 5.5 million association members and nonmembers attend conferences each year, which is more people than all but one of Chicago’s top sightseeing, cultural, or performing arts attractions.According to the tourism promotion group Choose Chicago, the total economic impact of conference attendees in Chicagoland is $7.15 billion based on the average amount spent per conference attendee. This is on top of the $10.3 billion in total annual expenditures. Chicagoland-based associations provide nearly 44,000 full- and part-time jobs in Chicagoland — more than Chicago Public Schools, the City of Chicago, or Cook County. Chicagoland associations are dynamic places to work, with total employee compensation of more than $4.2 billion, and they continue to grow. In a 2012 survey, 84 percent of Chicagoland associations said they planned to give raises in the next two years, and 34 percent said they would hire new employees in the next 12 months. These jobs offer an average total compensation package (including salary, taxes and benefits) of $84,000. The staff and members of Chicagoland associations contributed approximately 945 million hours of community service in 2010. To put that number in perspective, the Meals on Wheels program delivers an average of eight meals per hour. If it had this volunteer army to itself, it could deliver 7.5 billion meals per year. Associations give more than $125 million annually to charitable causes. Good works are also performed through the foundations of 640 Chicagoland associations, helping to advance many worthwhile charitable missions. Local schools, park districts, libraries and other community-based services also benefit from the more than $177 million Chicagoland associations pay in property taxes each year. Association members receive many benefits in support of their business and industry goals, their charitable mission or their personal career development needs. 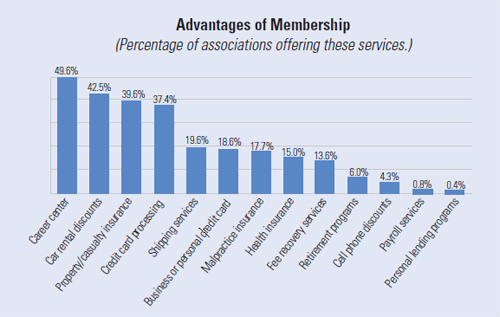 Nearly half of Chicagoland associations say they offer members a career center plus car rental discounts, property and casualty insurance, and credit card processing. The advance of industries and the education of members provide additional impact to Chicagoland associations as attendees use what they have learned to improve their organizations. ©2012 Association Forum. Data in this report is from an economic impact study conducted in 2012 by CliftonLarsonAllen for the Association Forum. Primary data sources were Guidestar reports on Chicagoland associations and a survey of Association Forum members and nonmember associations based in Chicagoland.